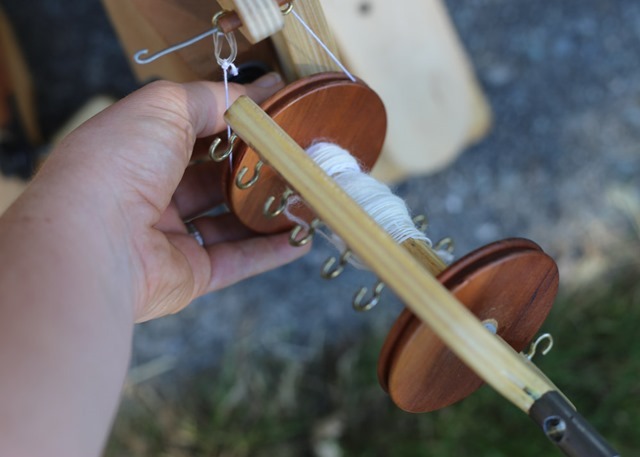 There are many, many, many spinning approaches out there and each does the exact same thing: Spin fibre into yarn. There are any number of saxony, castle, Norwegian, modern, electric and spindle (Charkha, quill, etc) wheels, not to mention supported, drop and Turkish spindles. The list could go on and on … and on. We all have our preferences due to the types of fibre chosen, yarns we want to make, physical needs and again, the list goes on and on. I am beginning to notice and realize that many spinners have multiple tools from drop and supported spindles to portable wheels to not-so-portable wheels that are permanent fixtures in our living rooms. 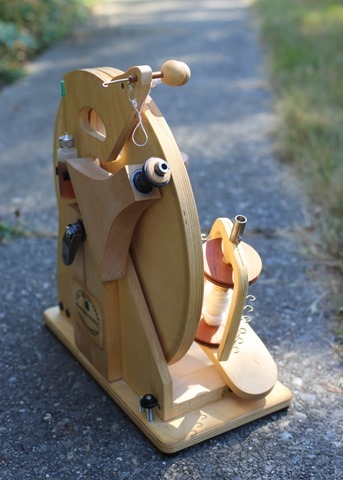 I had an interesting email conversation with a very accomplished spinner recently and her piece of advice for every spinner out there was to try as many different spinning tools and approaches as possible. I totally agree. Trying as many wheels and spindles as you possibly can opens up your repertoire of what you like and don’t like. 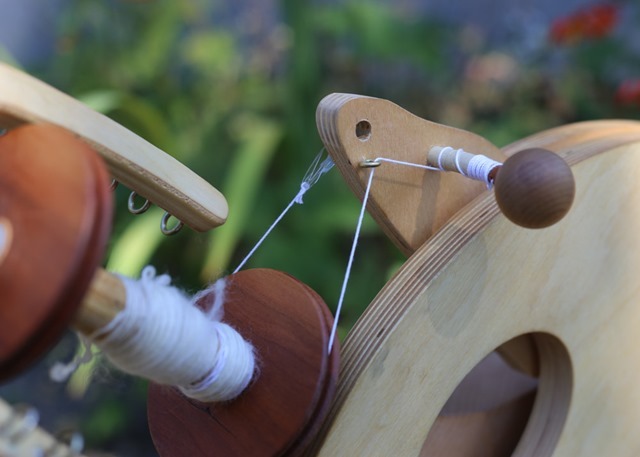 I think it also increases our vocabulary when we discuss spinning due to the various approaches to spinning out there from tensioning to twist to plying and so on. As I was thinking about my spinning ‘fleet’ recently, I continued to come back to the idea of having a truly portable wheel. One that might be quite different to when I’m used to but would fulfill a relatively utilitarian need of mine: Camping and travel. The Roadbug :: Spinning on these little wheels provides a very interesting perspective. There is something very comforting about pure, simple minimalism. There is very little to go wrong. To clean the wheel, I can get into almost every nook and cranny, which is actually incredibly important when we’ve been camping for a week or so and there’s dust and dirt everywhere. And by everywhere, I really do mean everywhere. The dogs track a huge amount of dust into the trailer and truck when we are away. I’ve long since let the dirtiness of camping go but I wasn’t overly excited about dragging the Hansen and its lovely motor through that mess for sometimes up to 3 weeks at a time! 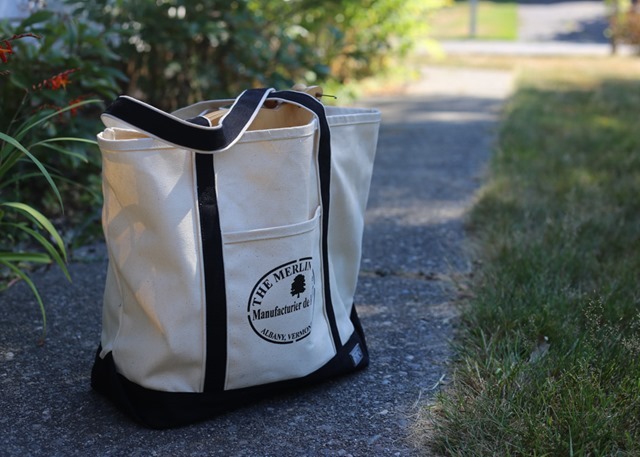 Plus, it fits in a lovely bag that I can sling over my shoulder and at less than 10lbs, I can carry it for a while. Everything I need for spinning on this wheel is in that bag. With room for fibre to spare. The Merlin Tree Roadbug :: Flyer storage for travel. I thought it would be interesting to share with you a little bit about these truly friction drive wheels. What is a friction-drive wheel you ask? 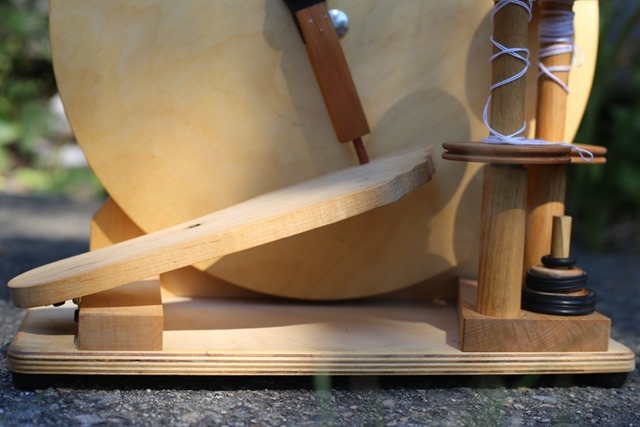 A very interesting approach to driving a spinning wheel is the simple answer but let me explain in some more detail. The Roadbug :: a Friction drive wheel. 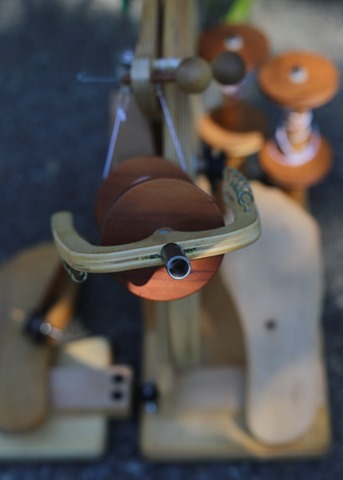 Upon studying the photo above, you will notice that there is a rubber drive ring sitting below the bobbin. 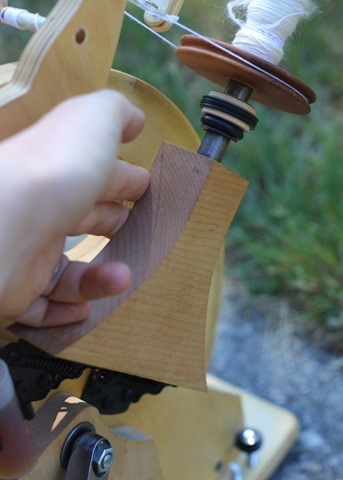 This ‘runs’ along the drive wheel as you treadle and creates your whorl ratios. The smaller the drive ring, the more times the flyer will rotate with one rotation of the drive wheel. 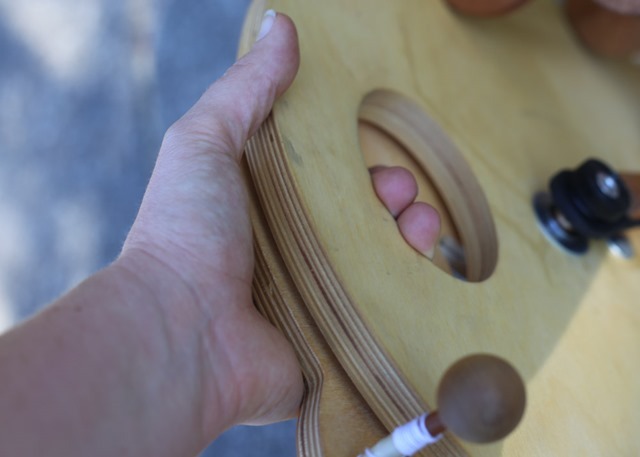 This particular wheel came with three drive rings that are stored on the base and provide 7, 9 & 13:1 ratios. The Roadbug :: Built in double Lazy Kate and storage for spare drive rings (here pictured 7:1, 9:1 ratios). 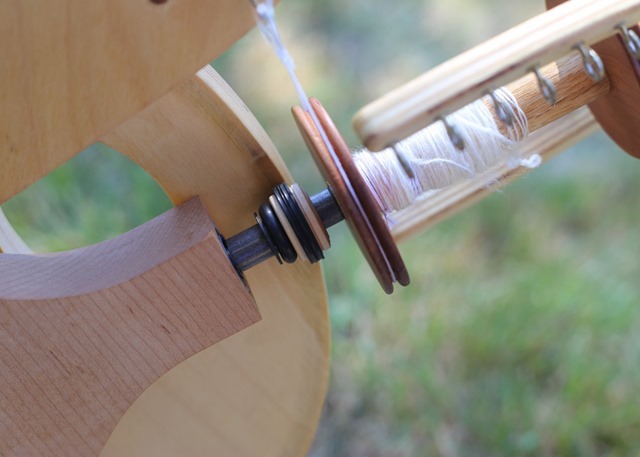 As the spinner begins to treadle, the drive ring rotates on the drive wheel. The Maiden on a castle wheel holds ones flyer on top of the drive wheel in front of the spinner (ie. a Lendrum DT, Schacht Matchless, Ashford Joy, etc). 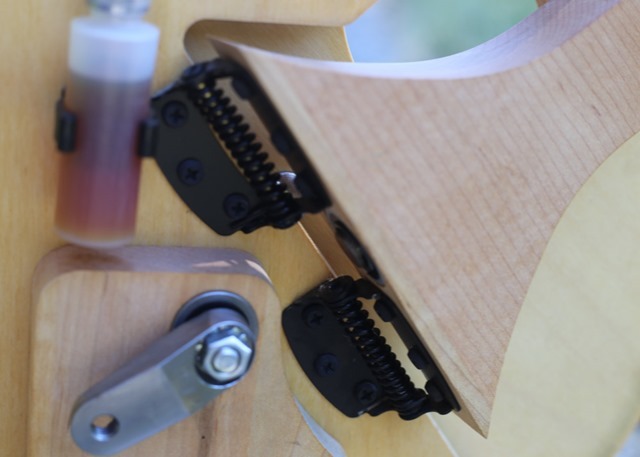 On the Roadbug, the maiden sits on an angle with hinges attached so that it can be articulated out, accommodating various drive ring diameters. The Roadbug :: Hinged Maiden to accommodate various drive ring diameters. 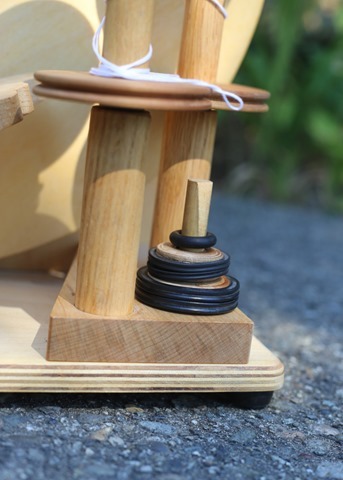 The Roadbug :: Oil holder, hinged maiden, flyer and bobbin attached. These are scotch-tension, or flyer-lead, braking systems. Many castle wheels place the braking knob below the bobbin but on the Roadbug, it is above. Semantics, really, and it doesn’t affect the tensioning experience for the spinner at all unless one has never used Scotch tension. The Roadbug :: I modified my brake band slightly by switching out the metal coil for an elastic band and cotton lace-weight for the fishing line. I like the response of this combination over the metal and line. That is completely personal preference after a chance to try many different combinations at a spinning workshop back in November 2014. Due to the need to oil many points on these wheels, I find disconnecting the flyer a wee bit messy. Holding onto the drive ring, you unscrew the flyer and remove the both the flyer and bobbin at the same time. 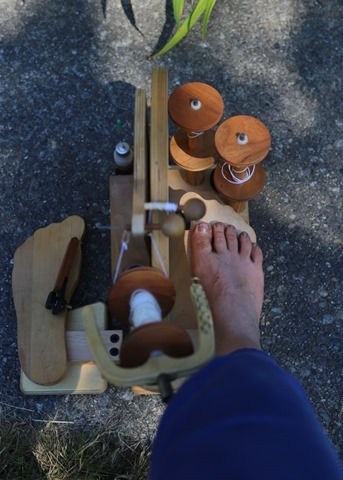 In one of the photos above, you can see the flyer sits in a small hole in the right treadle for transport. This brings me to treadling these wheels. 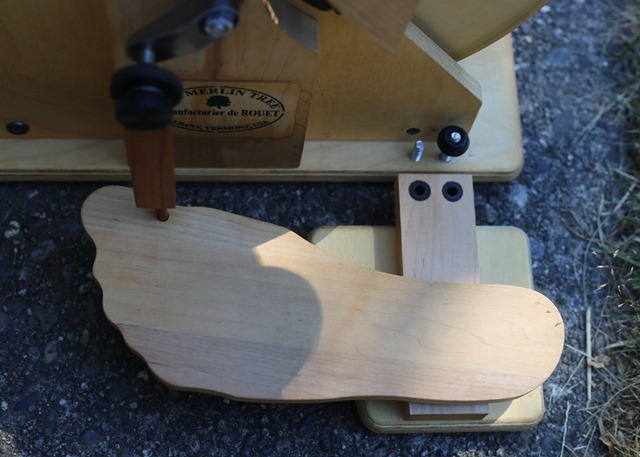 These are true “heel-toe” machines so the spinner must ‘rock’ back and forth between their toe and heel while treadling. When ‘upgraded’ to double treadle machines, the need to rock is removed. I’m actually not sure if I will be using this as a single- or double-treadle wheel yet. 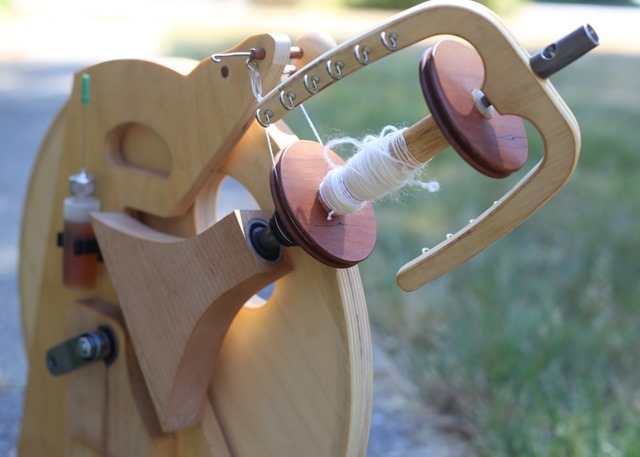 If spinning for short periods of time, I don’t think I will bother adding the second treadle. The Roadbug :: Hinged heel, leather attachment at the toe. Below, double treadle attachment. Lastly, this little Bug is truly meant to be taken along with you wherever you go. There’s a handle, it’s light and easy to put together. It seems to need quite a bit of oil but I suspect that’s because the previous owner spun on it very little and it sat for a couple of years. All in all, these are interesting wheels and one more for me to be able to speak to with a little experience. Friction drive wheels are compact, that’s for sure. Previous Post spun from stash and comparing knitted samples. Really interesting little wheel. Thanks for the in depth look at it!